I haven't featured another contemporary artist/illustrator/surface designer here yet, and I am so happy to share the work of the extremely talented Phanna Past as my first one. I discovered Past on Instagram over a year ago, and the amount of incredible work that she has created in that time truly boggles my mind. Much to the credit of Alessandro Michele, Past has been commissioned to make work for several Gucci projects, which is lucky for us because we get to enjoy the results of this wonderful collaboration! 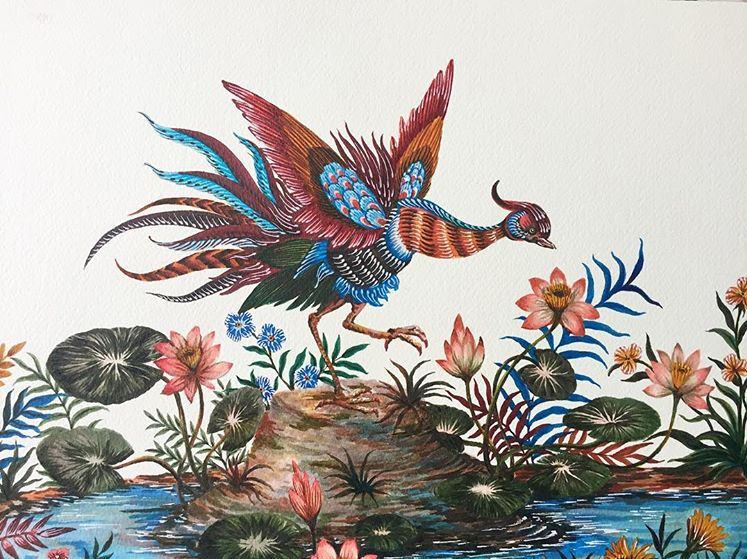 One of those projects was a series of illustrations of animals working at a "Wonder Factory" to create Gucci's Le Marchés des Marveilles jewelry collection. The illustrations have been adapted for all kinds of whimsical applications, such as life-size pop-up displays, an actual book, and animated videos. You can view the fantastical series on Gucci's "stories" page, and can enjoy a little animated fun in the video below. Another reason following @phannapast has been so enjoyable is getting to see some of the process—as far as I can tell, all of her illustrations are sketched in pencil first and then filled in with marker, a medium that is very unusual for this detailed, traditional style. Her control of the material is exceptional, and I love admiring her delicate shading, linework, and interesting color combinations. From a series of illustrations for a project called "Redefine Full Moon"
Amazingly, it seems that Past actually started out embroidering, if her Etsy is any indication, and continues to make intricate embroideries as well as skillfully creating objects by way of beading and a technique using pipe cleaners—yes, pipe cleaners. In short, I highly recommend following her along her creative journey, there is so much more to be blown away by! On left, a Lunar New Year illustration, on right, artwork created for Vampye.